Jonathan Ward is an author of books on the history of American manned spaceflight. He also serves as an adjunct executive coach at the Center for Creative Leadership. Today’s offering in our reflection on the fifteenth anniversary of the STS-107 accident is a music video tribute to the crew. While there are no graphic images of the accident in the video, please be aware that the content may provoke strong emotions. Please feel free to share this video, but note that it is intended for noncommercial use only. I had the honor of attending the NASA Day of Remembrance ceremonies at Kennedy Space Center this morning, as a guest of Mike Leinbach. As much as I thought I was emotionally prepared for the event, I could not help being moved to tears several times during the course of the service. During the opening acknowledgments, I was elated that Eileen Collins recognized Greg Cohrs from the US Forest Service for his tireless efforts to recover Columbia and her crew, from the day of the accident until the day recovery operations ended. Eileen said that NASA will never forget the support that Greg and the people of East Texas rendered during the recovery of Columbia. This year’s memorial program focused on four astronauts who perished about fifty years ago: Elliot M. See, Jr., Charles A. Bassett II, Clifton C. “CC” Williams, and Michael Adams. With the exception of X-15 pilot Adams, none of them had the opportunity to make it into space. Tal Ramon, the son of Israeli astronaut Ilan Ramon, who died in the Columbia accident, traveled from Israel for the event. Tal has lost not only his father in 2003 but also his brother Asaf, an Israeli Air Force pilot who died in a training accident in 2009. Tal is using music to help him deal with the loss of his father and brother. He sang and played his stunningly beautiful composition “Dmut” (Courage) and played a piano solo “Victoria” (Victory). His profoundly moving music said more than words could ever convey, and it touched a very deep part of my soul. Eileen Collins then reverently read the names of the fallen astronauts, and with that music still in our ears, it was impossible not to feel an overwhelming sadness at the loss of people who held such promise—but also to know that they died doing what they truly enjoyed. The ceremony then moved out to the Space Mirror, where Bob Cabana (Director of Kennedy Space Center) and Therrin Protze (Chief Operating Officer of Delaware North) laid a wreath emblazoned “Forever Remembered.” The rest of us were then invited to twine the stem of a rose or carnation into the fence in front of the mirror. It was a simple and beautiful way to bring closure to the event. 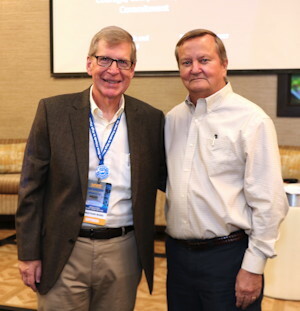 Afterward, I enjoyed connecting with people I’ve met over the years during my many visits to the Space Coast—Lee Solid, Bob Sieck, Russ Lloyd, Ann Micklos, Gerry Schumann, Steve Coester, and Jean Wright, just to name a few who were there. I admire their contributions and envy their connections to the space program. Their careers have included many long days and much thankless effort, but all of it has been important work. We couldn’t be exploring the universe without people like them. Greg Cohrs, his wife Sandra and his son Adam, and my wife Jane and I then met up with Mike Ciannilli, director of KSC’s Columbia Research and Preservation Office. Mike took us up to the Columbia Room on the 16th floor of the Vehicle Assembly Building. I had the honor of visiting the room in June 2015 when I first began working on the book. However, Greg and his family had not seen it before. The room is currently in transition. Mike has been working to upgrade the room to better fit its intended purpose—as a learning laboratory rather than merely a warehouse of Columbia‘s debris. Being in the room with Greg and his family was a powerful experience. Greg and Sandra had found pieces of Columbia‘s debris on their property in Hemphill after the accident. Greg of course managed the search operations for Columbia‘s crew in Sabine County, Texas, and then helped manage the debris recovery operations in East Texas after that. Adam had taken two days off from college a week after the accident to help search for the crew. And Mike Ciannilli had flown as a spotter on helicopters out of Palestine, Texas during the debris recovery. Again, I hold these people with utmost admiration for what they did in very tough times. On January 25, NASA and our extended NASA Family will pause to remember the astronauts who lost their lives in service to our country. The Day of Remembrance was instituted by then-Administrator Sean O’Keefe in 2004. He decreed that the last Thursday in January would be set aside to remember the astronauts who gave their lives in the line of duty. This year will mark the 51st anniversary of the Apollo 1 fire, 32 years since the Challenger accident, and the 15th anniversary of the loss of Columbia in East Texas. All three tragedies occurred within a one-week period in late January and early February, hence the chosen date to hold the Day of Remembrance. NASA employees and the space community will gather in various places across the country, most near the NASA centers, with common feelings of reverence, respect, and appreciation. We will honor all 24 fallen heroes with speeches and other such memorials—some formal, some less so, but all with the dignity one would expect, and deserved by those we celebrate. And so it will be again this year. For those of us on the Space Coast, the ceremony is always held at the Space Mirror at the Kennedy Space Center Visitor Complex. Dedicated in 1991 by Vice President Quayle, the black granite wall, 50 feet wide by 42 feet high, carries the names of the 24 astronauts who died in the line of duty. Their names are laser-cut through the 2.5 inch thick panels for all time and for all to know. The Astronauts Memorial Foundation administers the memorial among its other very worthy initiatives including educating America’s youth through innovative educational technology programs. I was recently asked to serve on the Board of the Foundation, a call for which I feel deeply honored. This year’s memorial event starts at 10:00 am Eastern Time, if you’re in the area and would like to attend. It begins in the Center for Education building adjacent to the Rocket Garden. The public is welcome and encouraged to attend. We hope you will pause and thank our lost astronauts for their sacrifices, no matter your location or connection with them. I hope the number of fallen comrades stops at 24. The important thing is, how does #1 manifest itself to make sure #2 happens? That’s better left as the subject for one or more follow-on posts, as it gets complicated pretty fast. It gets into some very fundamental questions about exploration, safety, experience, value, and values. For now I choose to simply embrace #1 and #2, and remember my friends privately. On the morning of Saturday, January 28, 1967 I was a 10-year-old boy riding with my family in our van in Naha, Okinawa. I vividly remember hearing on Armed Forces Radio that the crew of Apollo 1 had just perished in a fire. My father pulled over to the side of the road. My sisters and I went silent. None of us could believe it. The loss of my astronaut heroes devastated me every bit as powerfully as the assassination of President Kennedy just three years earlier. I worried that our space program had just ended. I was too young to appreciate the resolve of the country and NASA to continue moving forward despite the horrible loss. Exactly nineteen years later, I walked by a conference room at work where someone had turned on a TV. No one spoke. I saw smoke and vapor trails and was confused about what was going on. What seemed like an eternity passed, as I watched the replays of the fireball and vapor cloud and the solid rocket boosters careening in the sky. Apollo 1 had been an accident on the ground, but Challenger was the first time NASA had lost a crew in flight. And we lost another seven brave souls in flight on February 1, 2003 when Columbia disintegrated over Texas. The loss of Columbia and her crew affected me perhaps even more deeply than Challenger, as the advent of the Internet and NASA’s public outreach had enabled me to follow the crew’s training and mission for months. This was a crew who I felt that I knew, even though I had never met any of them. I started attending Spacefests and Astronaut Scholarship Foundation events in 2009. I’ve spent much of the past three years researching the Columbia accident, and now I know dozens of astronauts and other people who had worked on the Space Shuttle Program. I venerated the astronauts as a kid, and continued to put them on pedestals as an adult. But now I realize that I had never fully wrapped my head around the fact that the people who climb into space vehicles are real people with real families. True, they’re exceptionally competent and smart and brave and tough. But they’re also really nice people with parents and husbands and wives and sons and daughters who care about them and worry about them. I never truly knew what it was like to worry about someone until I became an Army dad, and my son went on his first—and second—and third—deployment to a war zone. That’s when you begin to understand the real nature of sacrifice in the line of duty. Our astronauts put their lives on the line every day to help make our world a better place. They have to balance the need to explore with the toll that it takes on their families. I’m thankful that Sean O’Keefe instituted the NASA Day of Remembrance as an annual milestone that provides us the opportunity to pause and reflect on the meaning of heroism—the willingness to put aside one’s personal concerns in order to serve the greater good. Let us be grateful to those brave people and their families for their service to our country and to humanity. 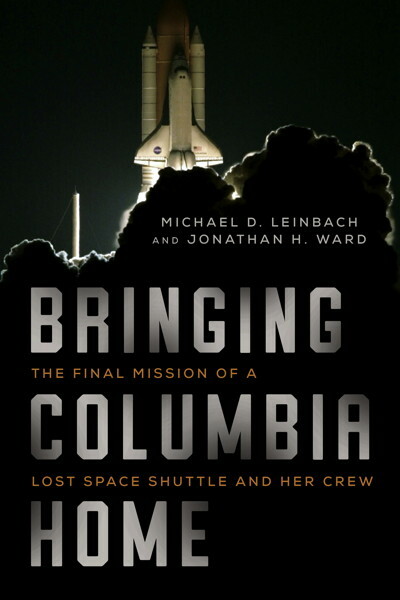 “Bringing Columbia Home” was officially released today! Demand has been unexpectedly high. Our publisher has already ordered a second printing! Mike and I have several busy weeks ahead of us as we commemorate the crew of STS-107 and celebrate the accomplishments of the 25,000 Americans who worked to recover Columbia. Here’s where we’ll be in the coming weeks. Please come by and say hi if you’re nearby! Thursday, January 25: NASA Day of Remembrance. Kennedy Space Center Visitor Complex. Program begins in the education center at 10:00 and moves to the Space Mirror at 11:00. Friday, January 26: NASA Apollo-Challenger-Columbia Lessons Learned Program panel, “Columbia: Lessons and Legends of Recovery.” Kennedy Space Center Training Auditorium, 1:00-3:00. Open to KSC-badged personnel only. Saturday, January 27: Wreath-laying, Sand Point Park, Titusville, 10:00 a.m. – 11:00. Book signing afterward at the American Space Museum, 308 Pine St, Titusville. We will have a limited number of books for purchase (onsite sales benefit the museum). Bring a book of your own and we will sign it free of charge. Signed and personalized book plates will also be available. Monday, January 29: Live interview with Brian Freeman on “True Story” (http://tobtr.com/10519951) at 8:30 p.m. EST. Wednesday, January 31: Panel discussion at Johnson Space Center with Mike and Wayne Hale, 8:00 a.m. – 10:30 a.m. CST. Open to JSC-badged personnel only. Book signing immediately afterward. Thursday, February 1: Memorial service at 7:45 a.m. CST, followed by book signings and discussions at the Remembering Columbia Museum, 375 Sabine St., Hemphill, Texas. Saturday, February 3: Presentation to Space Exploration Educators Conference, Space Center Theater, JSC, 3:30 – 4:30 p.m. Book signing at the Space Center Houston retail store immediately afterward. Sunday, February 11: Book signing at the National Air and Space Museum’s Udvar-Hazy Center, 14390 Air and Space Museum Parkway, Chantilly, Virginia. 12:00 p.m. – 3:00 p.m. EST. Monday, February 12: “What’s New in Aerospace” program, National Air & Space Museum DC building (Independence Ave. at 6th St. SW, Washington DC) in the ‘Moving Beyond Earth’ gallery, 2:00-2:30 CST. Details at https://airandspace.si.edu/events/story-behind-space-shuttle-columbia-recovery-mission. Live webcast. Mike and I were privileged to be invited to speak at the George W. Bush Presidential Center in Dallas on January 16. Our host was Kevin Sullivan, former communications assistant to President Bush. Sean O’Keefe, NASA’s Administrator during the Columbia accident, sponsored the event. Also on hand were Bill Readdy (three-time space shuttle astronaut and former associate administrator at NASA) and Ron Castleman (regional director of FEMA). The talk coincided with the 15th anniversary of the launch of Columbia on her final mission. Despite the bitter cold, the reading room was packed! Mike and I were very sorry that our friends from East Texas were unable to attend the event because of the icy roads. We did our best to sing their praises. Sean kicked off the discussion by setting the context for the security concerns for the mission—only 16 months after 9/11 and with Israel’s first astronaut on board. He also provided fascinating insights into President and Mrs. Bush’s concerns and care for the families of Columbia’s crew after the accident. Mike described the incredibly empty feeling he experienced when he stood at the Shuttle Landing Facility at Kennedy Space Center on February 1, 2003 and realized that Columbia hadn’t shown up, and no one knew where the shuttle was or what had happened to it—only grasping that something must have gone horribly wrong. Mike and I also discussed the incredible support that the people of East Texas provided in responding to the immediate aftermath of the accident. We also discussed the seamless way that FEMA, NASA, and EPA led the federal response in the ensuing days. The hour allotted for the discussion flew by!